Earlier this year we did a post about the caliber Venus 175. One of the most notable watches equipped with that same old school manual wind movement is the Breitling Chronomat reference 217012. Show above in all it’s glory, these chronos date all the way back to the early 1940’s. Lot’s of history and evolution there. Now days you would get a similar piece with an ETA/Valjoux 7750 or even better maybe the new in-house caliber Breitling 01. 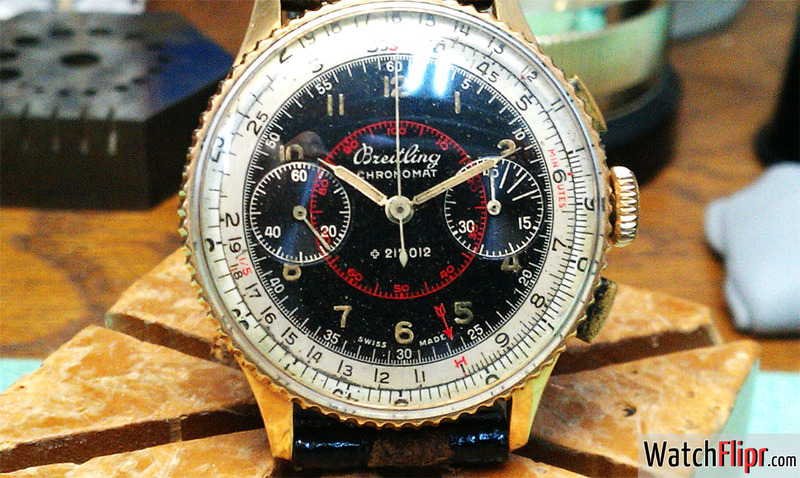 Overall a great watch to have in the vintage side of your collection, especially if you’re a Breitling guy. What does 217012 stand for? Those 6 digits are the Swiss patent number for the watch design issued in circa 1940 – specifically the twin chronograph layout and slide-rule feature. Never knew the number on the dial was for the patent. Interesting info, thanks. Find deals on eBay on new and used Breitling watches in gold and stainless steel.